As a CMO, who has been supporting CMO’s for 25 years with hundreds of analytic and data driven marketing campaigns across multiple industries, I am all too familiar with the latency inherent in the CRM campaign process of large enterprises. 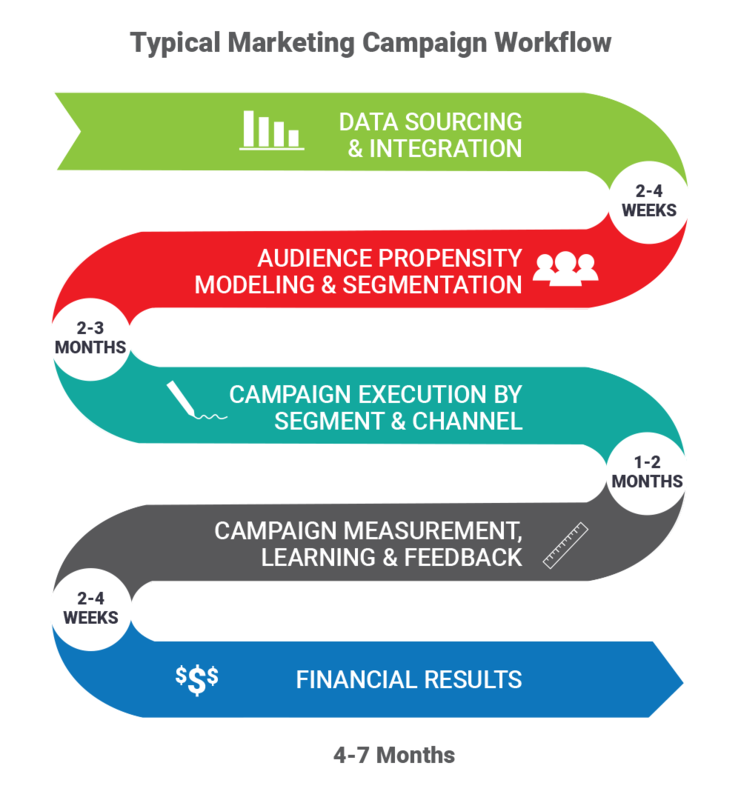 Marketers experience a multiple months-long workflow to acquire and integrate data, perform segmentation and modeling, select and activate audiences for campaigns, execute and measure results, and then integrate findings into their next campaign. Latency, lack of precision or relevancy, and an inability to apply learnings in a timely manner is an age-old struggle. This process is ripe for significant efficiency gains through AI technology and applications. Enter machine learning for marketing. Marketing campaigns, including addressable digital and TV, are the lifeblood of revenue for many brands. 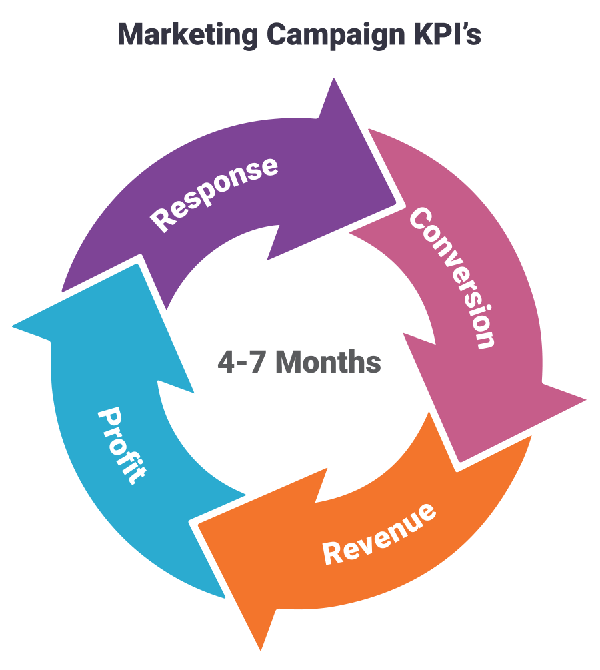 Every time you pull the campaign lever, revenue is generated in a predictable manner. Once established, campaigns become increasingly cemented into their well-defined and lengthy process. Most involved are reticent, or at the very least, unable to easily change the process simply due to the number of tasks and people involved, as well as the data sources, channels, vendors and calendar windows required. Tasks are many, time consuming and cumbersome. What if you could plug technology into your existing process, that made it twice as fast, agile, efficient, precise, and relevant? If you could pull that campaign lever more frequently, with better results – without risking the predictable nature of existing campaigns you would, wouldn’t you? This is the promise of machine learning, that is slowly finding its way into different parts of the campaign workflow. However, like all technology, marketers struggle to know what ML to use, where to use it, how to use it and whether to trust it. Since most ML is a black box, issues with trust relative to what its being predicted and why, what data is being used by the algorithms and why, and the need to explain what it’s doing for business, privacy and compliance reasons are big issues. Not all machine learning is created equal when it comes to tightening up the CRM campaign process. Enter similarity based explainable artificial intelligence (XAI). 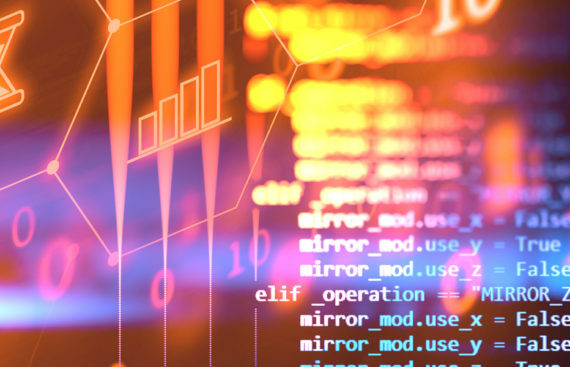 Similarity based XAI, unlike any other ML, is built on a method called similarity (knn or nearest neighbor), that in its own right, addresses challenges across the campaign process. 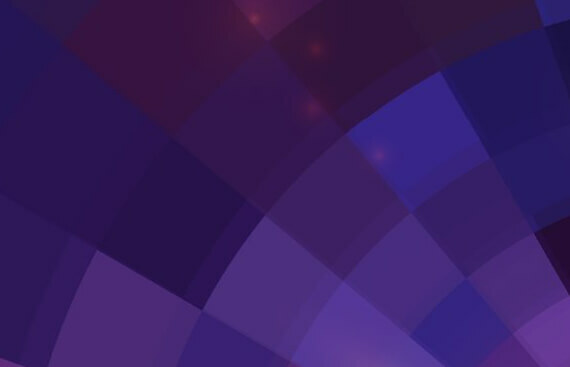 The method also enables high precision and transparency to inform marketers with the reason, “Why”, a customer or prospect is predicted to buy, at great speed, at an individual prediction level when combined with proprietary techniques in search and metric learning. Think of a CRM driven marketing campaign being supported by a set of tools, loosely bolted to a hard surface. What ML technology can tighten down the most bolts across various steps of the process to make existing functions smarter, faster, more efficient, more precise and intelligent? This is where similarity based XAI technology holds an advantage. With precision to match any other method, while using similarity-based functions to enable multiple aspects of the workflow, it stands out as a versatile and powerful method, that handles the most marketing functions and tasks of any ML. Similarity based XAI is an analytic workbench for marketers and their analytic teams because it has the greatest breadth of impact. In a one to moment world, in which the relevancy of marketing messages and customer experiences are paramount for building trust and retaining existing customers, the current process is simply too slow, too imprecise and too irrelevant to the customer. 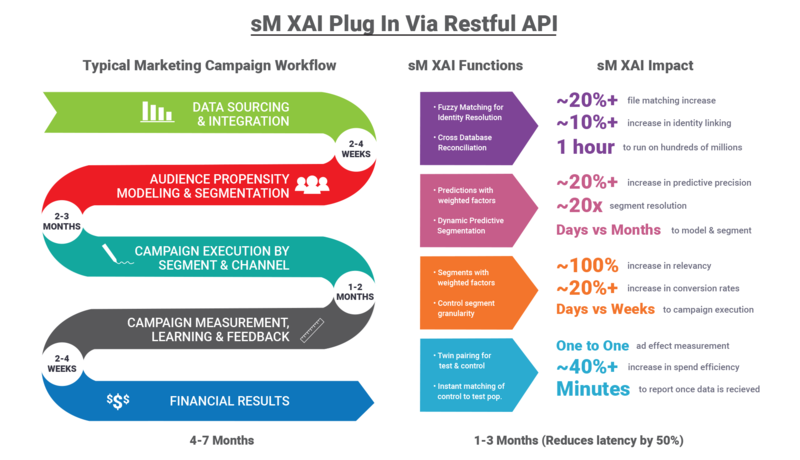 Reducing latency by 50% (for those processes that bookend the campaign window itself) and increasing precision and relevance by 20%-100% or more is possible, through similarity based XAI, not in a narrow way but in a broader way – and can be activated across the workflow in a phased approach for maximum impact. So how does similarity based XAI enable relevancy through Dynamic Predictive Segmentation? 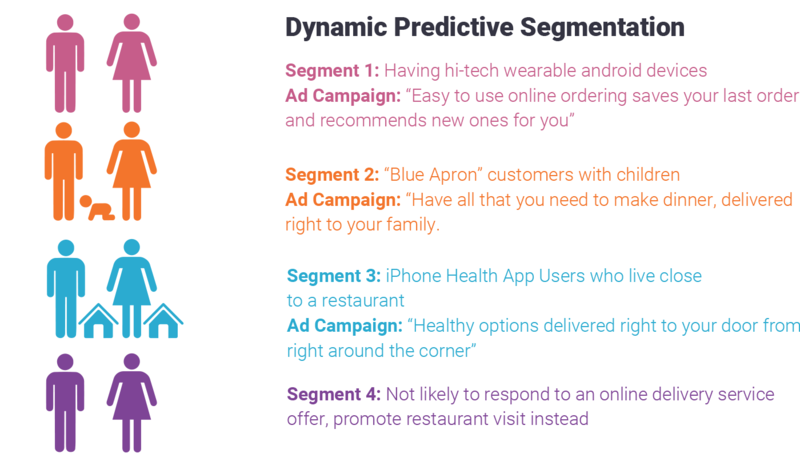 Here is a simple example using segmentation focused on online restaurant food delivery. First the segments are generated in days, if algorithms need to be trained, or in minutes / hours if already trained and ready. Similarity based XAI automatically generates segments based on predictions that share common characteristics. 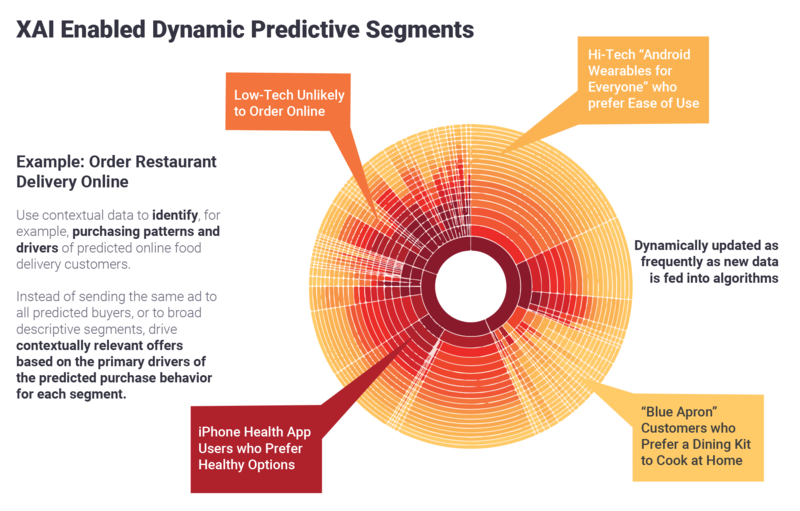 These segments are inherently predictive, contextually relevant and actionable. However, super segments often reveal themselves for immediate focus, along with the most important factors that characterize a particular segment, in order of importance. These factors are the drivers of the predicted behavior. Black box ML weights all factors equally in making a prediction which means it’s adding predictive power but not generating more granular customer segments based on the relative weights of the factors associated with a buyer’s predicted behavior. The prediction and the segments are disconnected. With similarity based XAI, factors are dynamically weighted by the algorithms and reveal what the key drivers of predicted behavior are to target messages and offers. The prediction and the segments are one and the same. For CMO’s, the ability to run segmentation in days and increase precision and relevancy at the same time is very valuable and a “must have” in today’s environment. 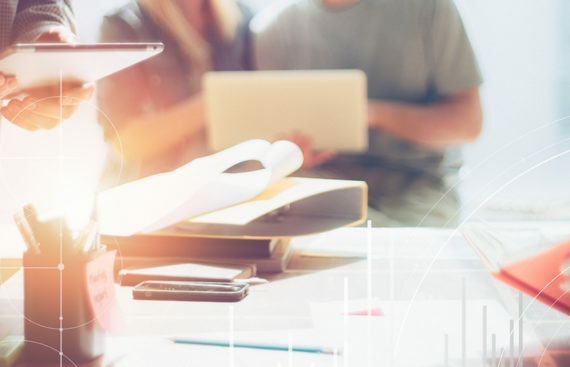 When your company needs to make a strategic decision to pivot or stay on course, similarity based XAI gives your data a “voice” that provides speed to insight, a critical need for CMO’s to maintain competitive positioning and a high degree of relevancy to customers constantly changing needs. One of the key advantages of XAI is that it can plug in easily into existing processes via a restful API. Without disrupting current workflows, functionality can be added to enhance specific processes. Each area carries its own fast payback and ROI, but once deployed across the workflow – the cumulative impact is significant. ROI impacts of efficiency, increased response and conversion span any dimension of the customer lifecycle, from acquisition to reactivation and retention. It doesn’t take many basis point increases to yield millions in pre-tax operating profit for most brands. The same technology can be used to achieve significant relevancy in inbound customer experience applications. With recommendations based on “Why” someone is contacting you, relevancy can be up-ticked on the inbound side in a deployment time-frame that modernizes the current state very quickly for many brands that lag behind. Similarity based XAI continuously learns on previously successful interactions to create new ones based on how similar one customer is to another. And this creates even more impact opportunities – and even more importantly, relevant moments of interaction with customers. Similarity based XAI is truly a next generation analytic workbench for marketing.